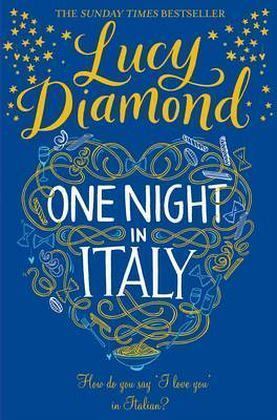 One Night in Italy is a charming, funny and heartwarming novel from Lucy Diamond, author of The Beach Cafe. Is Italian really the language of love? A new class of students hopes to find out . . . Anna's recently been told the father she's never met is Italian. Now she's baking focaccia, whipping up tiramisu and swotting up on her vocabulary, determined to make it to Italy so she can find him in person. Catherine's husband has walked out on her, and she's trying to pick up the pieces of her life. But she'll need courage as well as friends when she discovers his deception runs even deeper than infidelity. Sophie's the teacher of the class, who'd much rather be back in sunny Sorrento. She can't wait to escape the tensions at home and go travelling again. But sometimes life - and love - can surprise you when you least expect it. As the evening class gets underway, friendships form and secrets from Italy begin to emerge. With love affairs blossoming in the most unlikely places, and hard decisions to face, it's going to be a year that Anna, Catherine and Sophie will never forget. Lucy Diamond grew up in Nottingham and went to university in Leeds where she studied English Literature. After graduating, she worked in publishing and at the BBC, and in her spare time she began writing children's books under a number of different pen names. Two small children later, an evening class in creative writing motivated her to try a longer piece of fiction and explore some of her own feelings about motherhood. This eventually became a novel, Any Way You Want Me, and she was thrilled when Pan Macmillan made her an offer of publication. Now the author of fourteen novels and a Sunday Times bestselling author, Lucy writes with warmth and honesty about the joy and surprises, as well as the complications, that love, family and friendships can bring. Lucy now lives in Bath with her husband and three children and writes full-time. Her website is www.lucydiamond.co.uk She is on Twitter @LDiamondAuthor, and has a Facebook page Facebook/LucyDiamondAuthor.